One of the fundamental tenets of my winemaking is the willingness to explore…new styles, new blends, and new varietals. So, you’ll imagine my excitement when I was faced with the opportunity to experiment with a grape varietal that is little known outside of its home country. I simply had to get my hands on some! 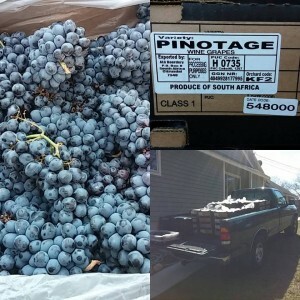 This spring, the Official Grape-Getter sprang into action again to pickup 1000 lbs of South African Pinotage! Yep, you read that correctly. PINOTAGE, baby! 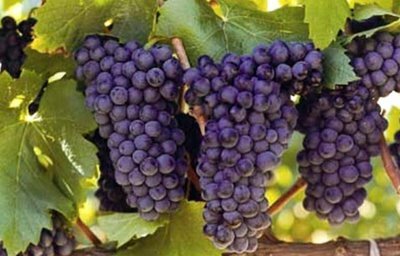 Pinotage is a grape varietal indigenous to South Africa, where it arose from a cross between the European varietals pinot noir and cinsault. For a little history on the grape, see here. Modern politics in the 20th Century resulted in disastrous impacts on the South African grape industry, where a once proud tradition of quality winemaking was reduced to jug wine and brandy production for the country’s own consumption after extreme economic sanctions were levied in response to their apartheid policies. Fortunately, sanity and equal rights triumphed in the end, and a new dawn has arisen for South Africa and its wine industry. Today, grape growing and winemaking has reached new heights of quality and South African wines are viewed with increasing respect and admiration. Last week, I made the journey to pick up 1000 lbs of pinotage grapes from their long journey from Breedlekoopf in the Breede River Valley (about an hour east of Cape Town). The growing season has been very dry with a heat wave starting in December that resulted in an early harvest. In short order after returning to Westford , the grapes were destemmed into fermentation vats. The grapes were in incredibly good shape. with excellent Brix (sugar levels). The heat wave this vintage was well evident in the low acid levels, so I had to add a wee bit of tartaric acid to drop things into more reasonable levels. I will readily admit that this is an experiment in the truest sense. Pinotage is not grown extensively outside of South Africa, so I’ve never had an opportunity to work with this grape before. Google will have recorded extensive Internet searching for fermentation advise from my IP address! Hopefully, I’ve been able to distill the best advice into a fermentation plan! Since the crushing, fermentation is progressing quickly along. Right now, the vats smell of gorgeous fresh fruit aromas, so I am very pleased with the progress. The final direction for this wine will depend on how the flavors progress in the future. In the meantime, I invite you to descend upon your nearest fine wine shop and try a Pinotage for yourself! Then, check back with Aaronap Cellars in 2017-2018 as we roll out the ONLY pinotage produced in Massachusetts! Just wanted to say hello. I just had a bottle of your 2016 Chenin Blanc that was wonderful. I purchased it at the Boston Farmers Market. What a nice introduction to your winery. I’ll definitely look for more of your vintages. Hopefully I can find the pinotage. Keep up the great work and great wine and thank you for sharing it with us. Thanks John! Very glad you enjoyed our Chenin Blanc. The Boston Public Market wine shop just stocked our Pinotage. If that’s not convenient, we can easily ship orders placed through our website within MA. Hello! I recently shared a bottle of your Maple Wine at a holiday dinner party—and everyone was delighted! All asked where to buy the wine; several photographed your label to show merchants at local wine stores. Is your Maple Wine available? If so, where may I purchase some? Thank you for your delicious wines! Harvest 2015. A season of “NO”!